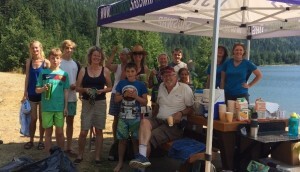 Home > Events > Happy Mussel-free New Year from CSISS! Happy Mussel-free New Year from CSISS! Happy New Year from CSISS! CSISS had a very successful 2017 thanks to our dedicated staff, volunteers and funders who all contributed to the important work completed this year. A sincere thank you for your support and we look forward to keeping you up to date with invasive species issues in the region over the year to come. 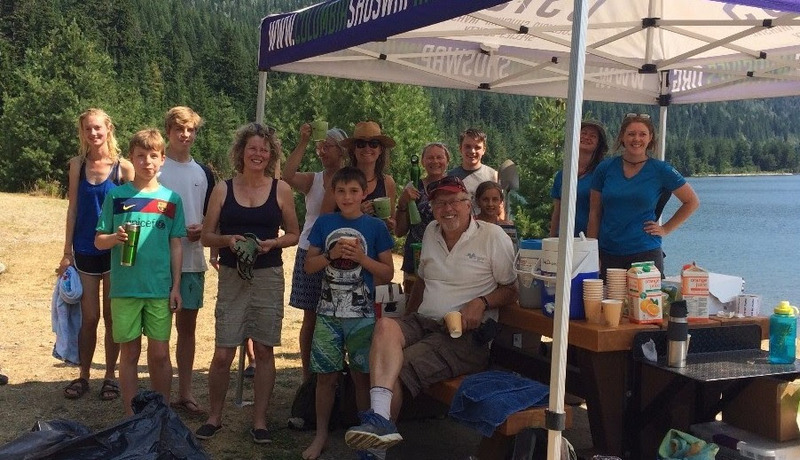 Columbia Shuswap region free of Zebra and Quagga mussels for another year! Throughout the 2017 summer season CSISS staff sampled 26 water bodies across the region for the presence of invasive Zebra and Quagga mussels (total of 51 samples collected). We are happy to report that all our samples tested negative for these very invasive organisms. Similar testing has been carried out across the province and so far there is no evidence for the mussels in BC. Next summer the province will be continuing with it’s watercraft inspection stations along borders of the province. Be sure to stop at these inspection stations when entering BC if you have any sort of watercraft or water toy on board, including smaller craft such as canoes, SUPs, kayaks or inflatable boats. Remember, Clean, Drain and Dry your watercraft and water toys when moving from one water body to another to help prevent the spread of invasive species. CSISS attended 184 events, spoke with over 4,600 people and was mentioned in 42 news articles across the region.CSISS worked with more than 220 partner organizations, 44 of whom were new in 2017. CSISS targeted outreach to groups such as realtors, city planners, garden centres and florists, marinas, and pet stores that will have a high impact in the reduction of invasive species spread. CSISS presented to 27 youth events about the ways to reduce the spread of invasives in our region. CSISS educates regional stakeholders and landowners on invasive plants found on their property. 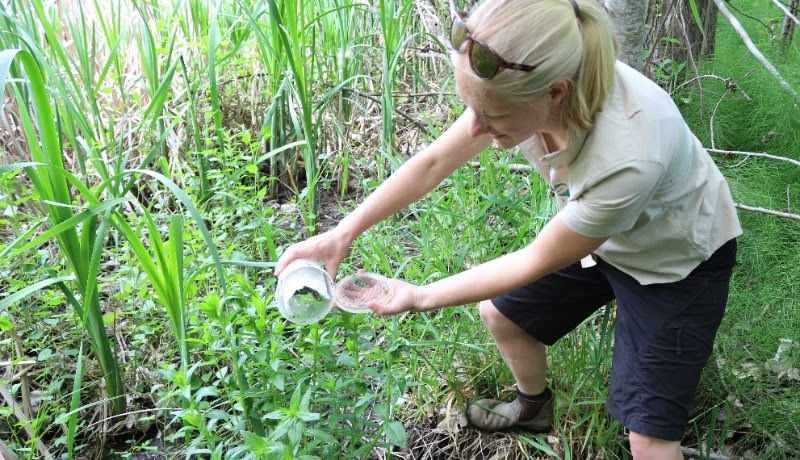 Many private landowners and most public stakeholders are now treating their knotweed in the CSRD region.CSISS completed two releases of biological agents effective in the control of purple loosestrife. 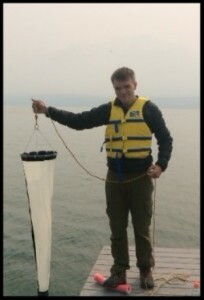 CSISS collected 51 plankton samples from 26 locations on 12 water bodies testing for invasive mussels. No mussels were found in the region. CSISS completed 493 invasive plant surveys, including 100 new site surveys. CSISS completed mechanical treatments at 43 locations, treating a total of 0.35 hectares. 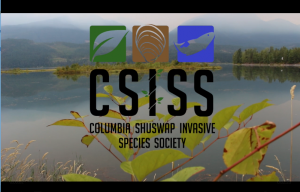 Top Invasives of the Columbia Shuswap poster. 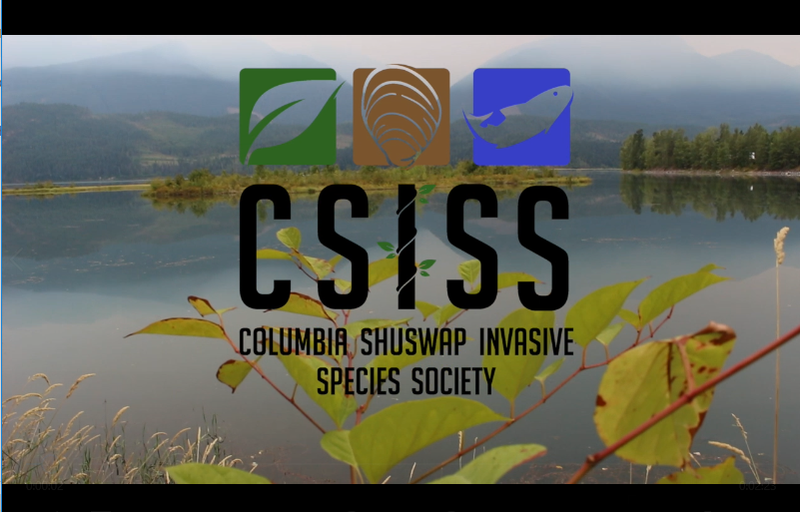 Check out our new Top Invasives of the Columbia Shuswap poster. 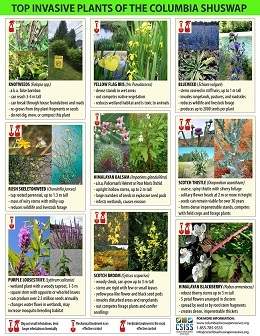 It shows our region’s top priority plants, their identifying characteristics and treatment options all in a handy double-sided full colour poster. Download the full size pdf here. In 2017, the ISCBC ran a video competition. CSISS’s summer student Braden Lamareux entered the competition and was placed runner up! Watch his video and the that of the winner here. March 15, 2018: CSISS regional Land Manager meeting, CSRD Board room, Salmon Arm (SAVE THE DATE, more details to be announced). Book a teacher professional development day to learn how to teach about invasives. Lean more here. Ordering plants for the spring? Already starting to plan your garden? 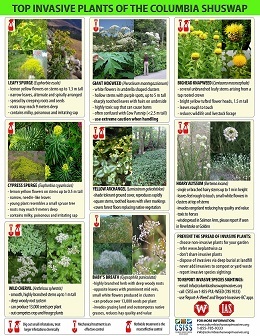 Make sure it’s invasive free by checking www.beplantwise.ca and our regional invasive plant list here. Have a safe, happy and invasive-free New Year from all of us at CSISS!